Below is a Sebastian Bourdais update from INDYCAR following INDY 500 Qualifying crash. INDIANAPOLIS (Thursday, May 25, 2017) – Verizon IndyCar Series driver Sebastien Bourdais, injured in a crash May 20 during a qualifying attempt for the 101st Indianapolis 500 Mile Race, was discharged from IU Health Methodist Hospital on Wednesday and has been moved to a local rehabilitation facility. Bourdais sustained multiple pelvic fractures and a fractured right hip when his No. 18 GEICO Honda crashed into the SAFER Barrier in Turn 2 on the third lap of his qualifications attempt Saturday. The Dale Coyne Racing driver underwent successful surgery that evening at IU Health Methodist Hospital. “Sebastien is progressing amazingly fast for having pelvis and hip fractures, and considering the severity of the crash,” said orthopedic surgeon Dr. Kevin Scheid, an INDYCAR medical consultant. “He is walking with crutches, in good spirits and feeling good. 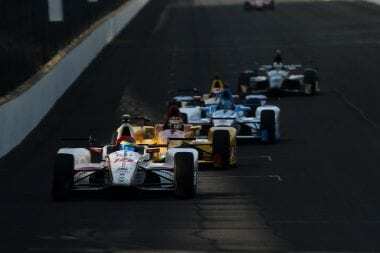 Bourdais, the 38-year-old four-time Indy car champion, expressed his gratitude to everyone involved in his care from the time of the incident. “I’m obviously really happy to be up on my feet and feeling pretty good about being able to walk on crutches,” Bourdais said. He continued, “I’m really thankful to all the people at IU Health Methodist and the Holmatro Safety Team, everybody at INDYCAR and my team, Dale Coyne Racing, for helping me achieve that so early after the crash. Updates on Bourdais’ condition will be released when available.